Did you know that you can eat comets? Not the real ones, don’t be silly. Room’s 16 and 17 were lucky enough to get to make ice cream comets, using ice-cream for the ice, smashed biscuits for the rocks and a cone for the tail. I’m pretty sure the real ones orbiting space aren’t nearly as nice as the ones we had. Everyone seemed to have the same thought that I did, can’t we eat them already! As some people crushed the biscuits with a rolling pin, my stomach was growling and getting very impatient. The icy goodness was beginning to get to hard to resist. After a while it just felt like Miss Garden was teasing me. Then it was finally my turn, I got a scoop of freezing chocolate ice-cream and headed outside to Mr Sommerville. 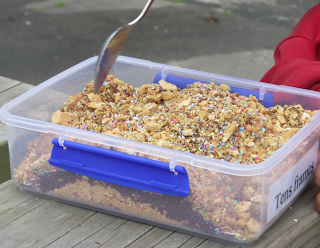 This was quite a messy job as we had melting ice-cream in our hands, plus a spoon full of crushed biscuits and sprinkles. Luckily I got the ice and rocks in to the tail before it fell apart. Looking around while eating my comet, I realised how much of a mess we had made. The food that we were meant to be eating ended up all over our hands, on the ground and even in the suage drain. Hopefully I wouldn’t be the unfortunate person to have to clean it all up. 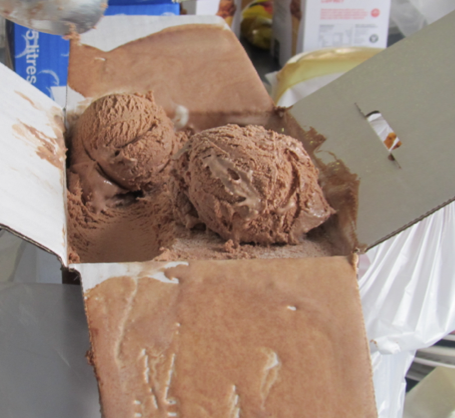 Our ice-cream comets were really messy but still delicious, and who knows, maybe next we’ll be making the Sun. I wonder what we would use for that? It sounds like you all had heaps of fun creating ice cream comets. Let me know when you've figured out how you could create the Sun. Your writing makes me feel like I really missed out on something - nice job! that is such an awesome story tia! Wish i was there you made it sound like alot of fun and your description of the comets were fab. What a fantastc story, you have written. I really enjoyed reading it. When I first opened up your blog and the first post I saw was this one, I just couldn't help but reading it. The pictures told me that I just couldn't miss this post. I can clearly tell you had a fantastic time making these ice cream comets. I hope my class does this someday. It would be so fun. Anyways, I really liked your writing, I was so thrilled by the way you wrote it. I could imagine how it would have been.